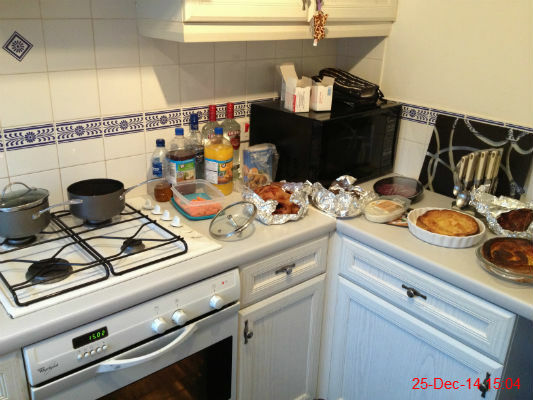 This year Lee and Leigh were the hosts. 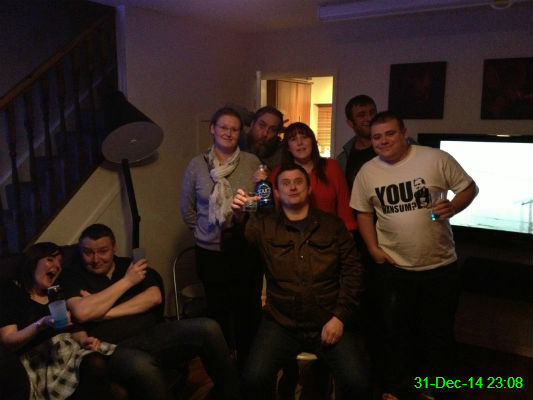 In the picture is (left to right): Nicole, James, Catherine, Lee, Christopher, Leigh, Anthony and Michael. 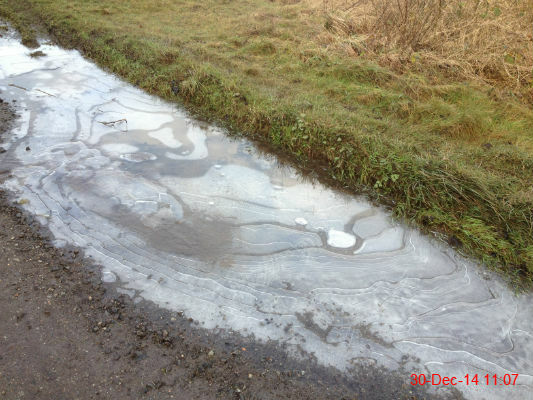 I went for an 11.4 mile walk today and many of the puddles on the paths I usually follow were iced over. It wasn't that cold though so I didn't risk standing on any to see if they'd take my weight! 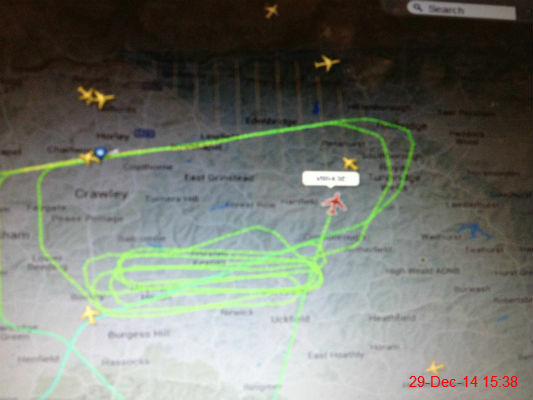 I spent a while watching this flight via Flightradar as it spent hours in a holding pattern before successfully landing at Gatwick despite a landing gear problem. It's a truly awful photograph which shows how little I've improved since I started doing this at the beginning of 2010! 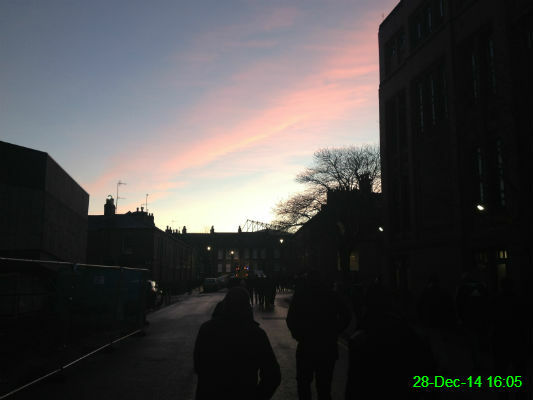 It was a beautiful dusk as we walked up to St James' Park to watch Newcastle play Everton. 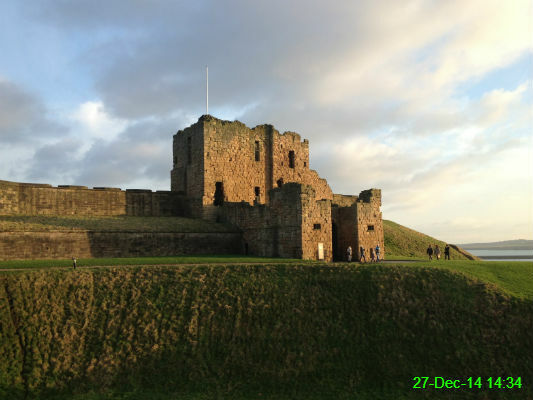 It's tradition to burn off some of the Christmas calories by going for long walks so today we walked just over 9 miles to Tynemouth and were rewarded with a bit of a wander around one of my favourite areas. 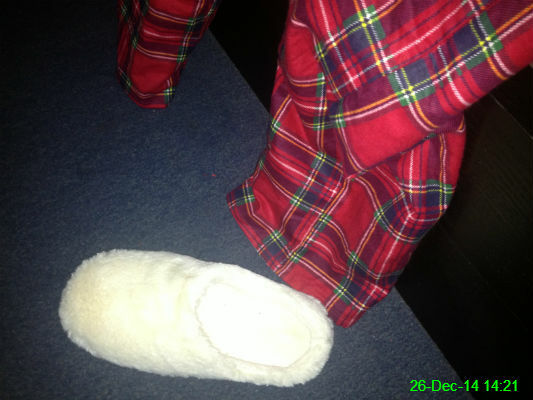 I wanted a day of loafing around the house so ended up wearing my new pyjamas and slippers for most of the day. We had Kathy round for Christmas dinner so while she watched TV I set to work assembling everything, with help from Michael. I'm pleased to report the mission was a success! 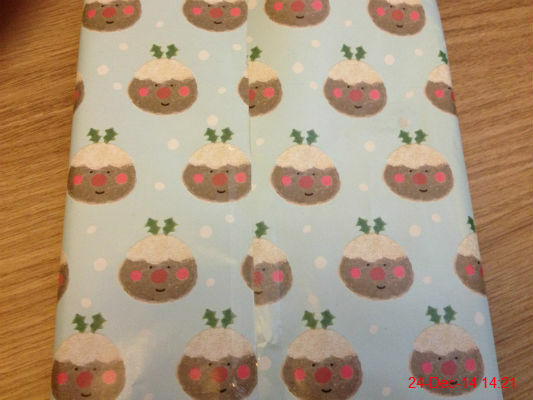 I finally got round to wrapping my Christmas presents. You could be forgiven for thinking I hate my family, given how aesthetically displeasing they look, but hopefully the contents will be well received. 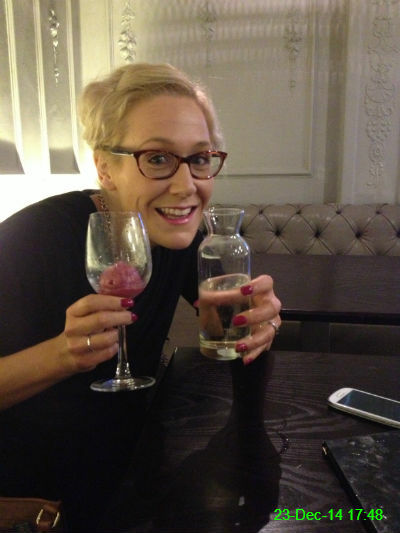 Lisa demonstrated how to perfectly pour prosecco into sorbet to make a beautifully mixed cocktail. 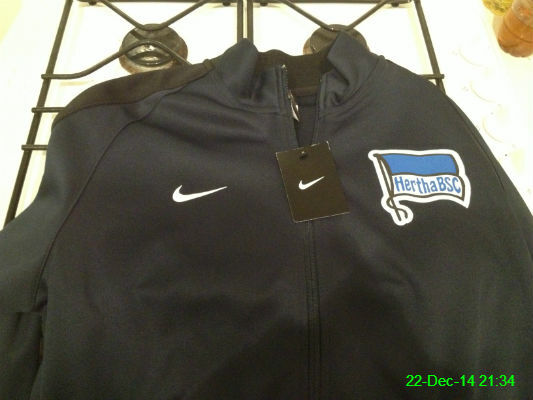 The lads chipped in to buy Michael this awesome jacket for his birthday. 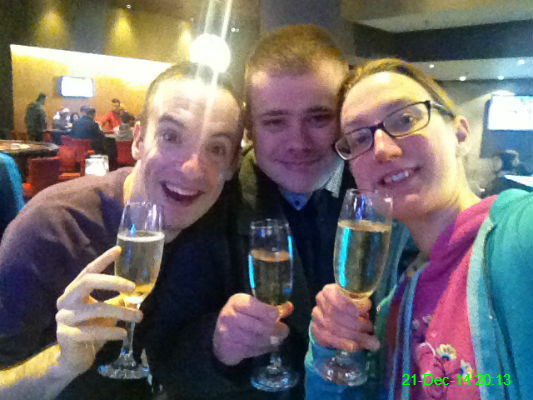 Newcastle 4th derby defeat in a row to Sunderland didn't ruin the celebratory mood on Michael's 30th birthday so we headed to Aspers and bought some champagne. We returned to the Blue Flames (having thankfully not disgraced ourselves last night!) 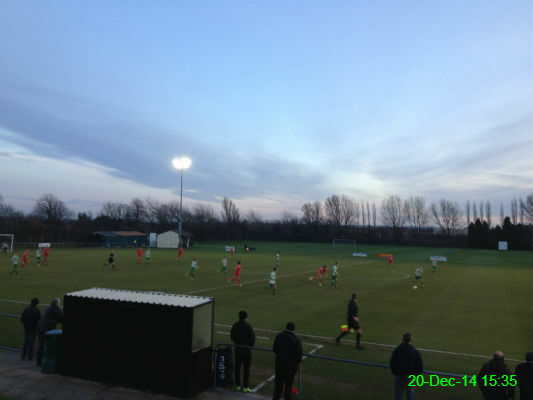 to watch West Allotment Celtic earn a good point against Consett. 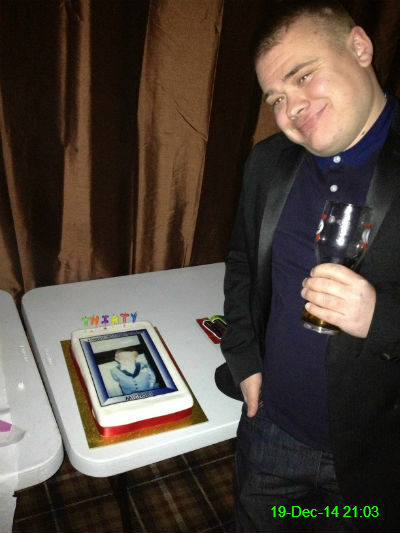 We celebrated Michael's 30th birthday (which isn't for another two days!) with a party for friends and family at the Blue Flames. He's still got the same smile! I went out with Nicola, Olwyn and Lorraine for our team Christmas party, which was a beautiful curry at Sachins. It was infinitely better than those cheesy hotel party nights! 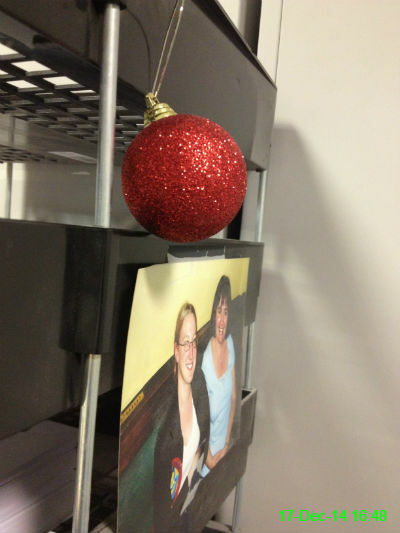 This glittery bauble is one of very few decorations I have up at work. I do love that photo of me with Linda on my 21st birthday as well! Scary to think that was almost 8½ years ago, but I don't suppose I've changed much. It's been a while since I saw one of these, and I certainly haven't tried this exact kind before, since it's from Harrods! 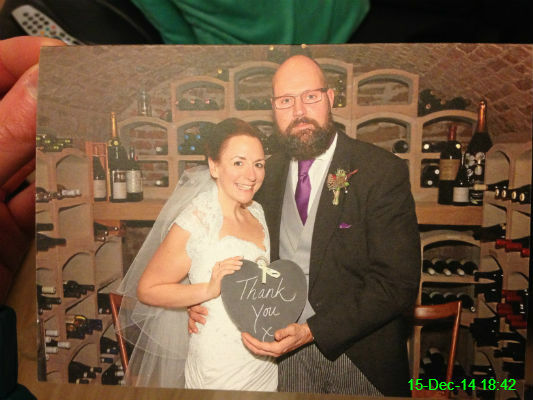 We received this lovely thank you card from Rachel & Ron. 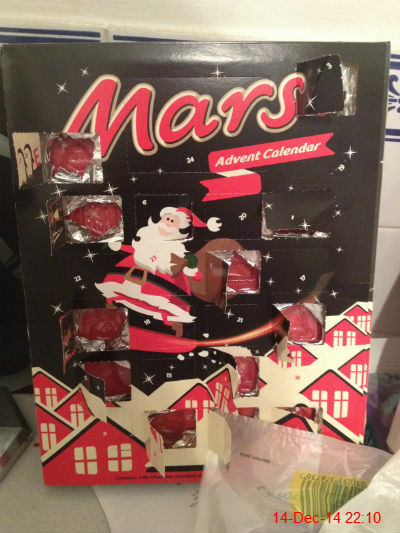 I'm making good progress on my calendar, it's just a shame the rest of my Christmas preparation isn't moving along quite as swimmingly! 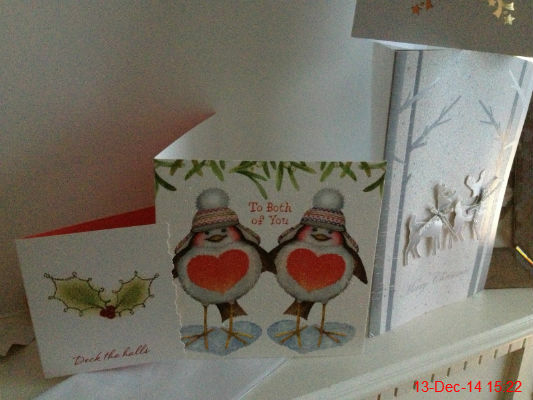 We're building up a nice little collection of Christmas cards so far. 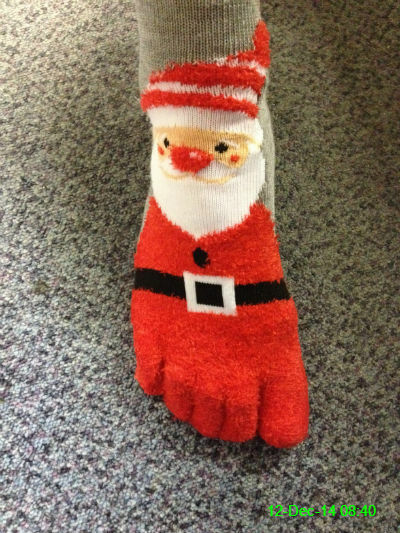 It was Christmas Jumper Day at work but I don't do Christmas jumpers, so I wore these instead. 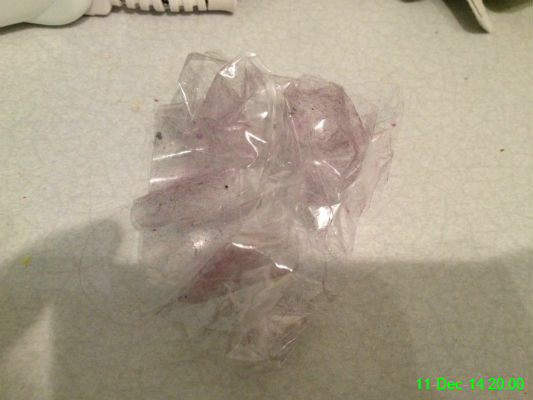 One of my pairs of black jeans has a habit of collecting a lot of fluff, so I went at them with some sellotape after ironing them to wear tomorrow. We finally got round to putting our team's Christmas tree up. 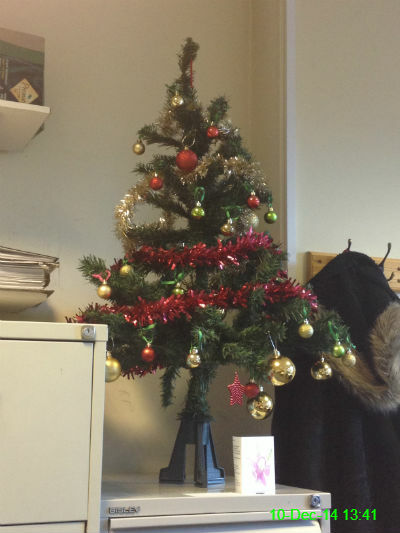 It's looking a little limp this year and is lacking an angel at the top so far, which is mainly because I've exhausted my supply of embarrassing photos of colleagues. I'll try and come up with something. 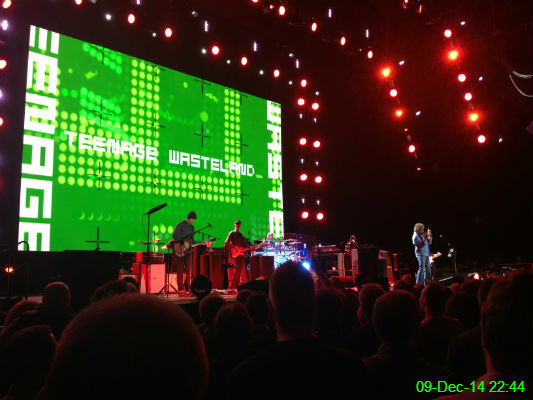 We were only 6 rows from the front at the Arena for The Who. Their setlist was packed full of hits, including Baba O'Riley which was, of course, what they were playing during this photo. Once again I got a free bottle of wine from work, courtesy of our court agents. 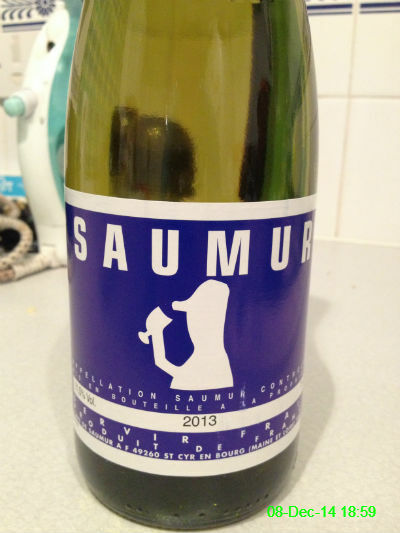 I've no idea what it will taste like but I do like the label. 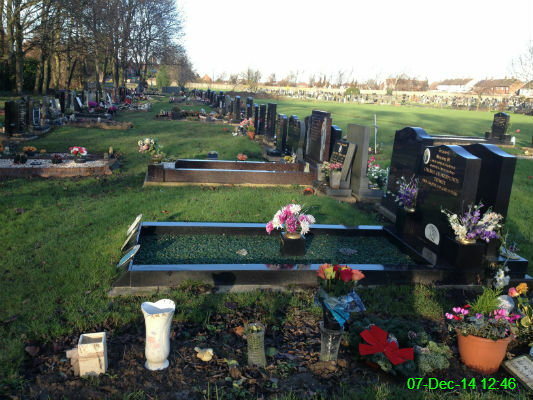 It would have been Michael's dad's birthday today so we went to his grave (not pictured) to lay some flowers. 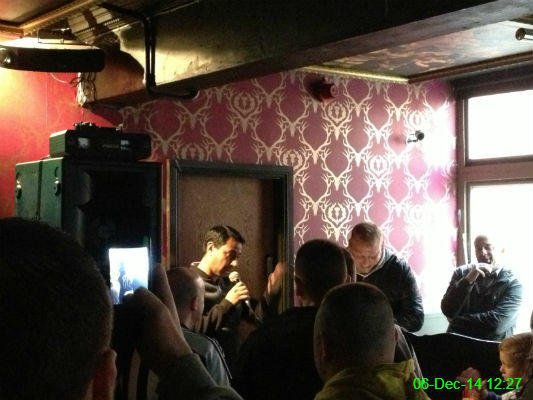 We had a couple of drinks in Number 9 Bar before seeing Newcastle beat Chelsea 2-1 and ex-player Nolberto Solano made an appearance. As usual my Friday morning started with a spot of cleaning. 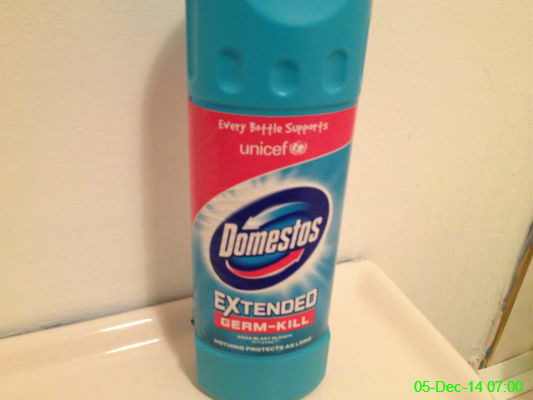 Apparently I'm supporting Unicef by using this particular brand of bleach. 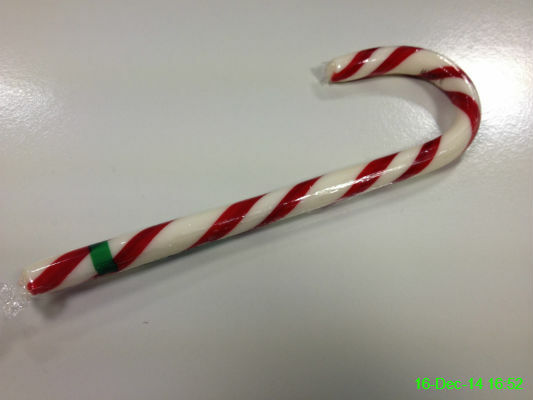 4 December 2014: Who Are You? 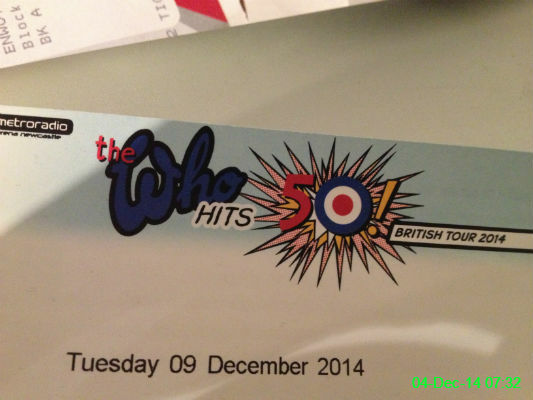 The first day back at work after a week off can be a little depressing so I started to look forward to the next event: going to see The Who. After several days of drinking more beer and less water I was ready to rehydrate. 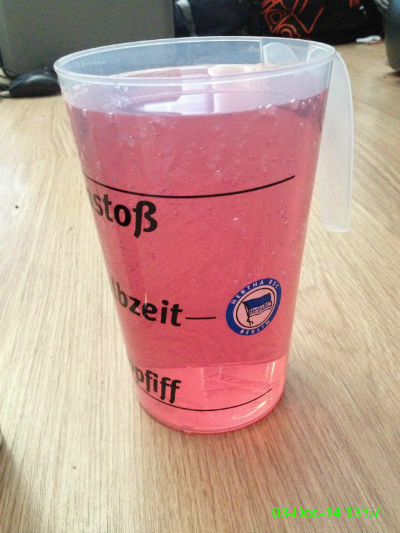 A litre of apple & blackcurrant squash in a cup obtained from the Olympiastadion was a pretty good start. 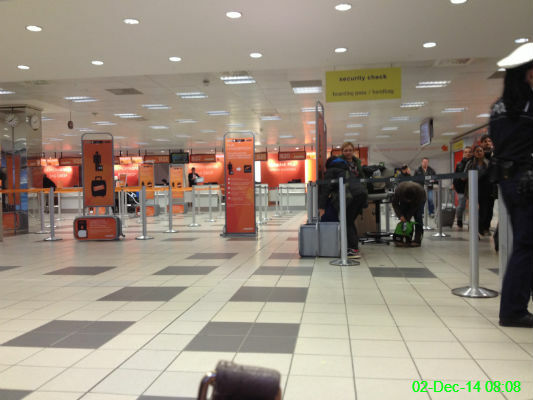 We were so organised in getting to the airport that we had to wait about 20 minutes before the baggage drop for our flight opened! 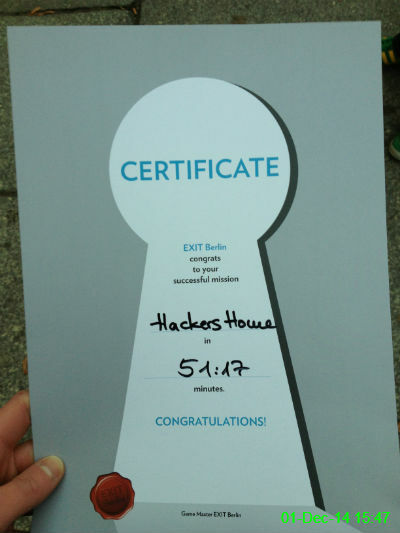 We spent part of our last full day in Berlin playing a live escape game. I love playing them online and it was great fun to take part for real. The aim was to solve the puzzle in less than an hour so we managed that and it didn't seem to be a bad effort for a team of just two people.